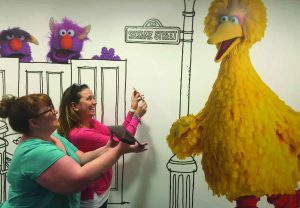 Producer Mindy Fila (right) and script supervisor Jennifer Capra get Big Bird’s signoff on Sesame Street’s new digital scripts. Don’t worry, kids; he’s not dying his feathers green. 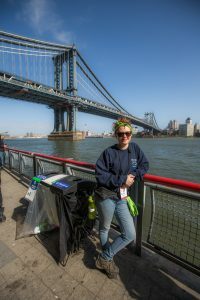 But Sesame Street, which has been entertaining children and adults alike for forty-five years has begun implementing “green” strategies in their writing and producing departments. The sound of air reverberating through brass echoes in the damp, still air under a morning sun; chairs pulled out and the smell of buttery croissants dance with the laughter-filled chatter of New Orleans’ Tremé neighborhood. This is Louisiana. Ten years after Hurricane Katrina’s storm surge inundated the state, a static tide of Cajun energy is on the rise. Left with largely inadequate federal recovery funding and thousands of residents awaiting proper restitution, Louisiana is both a grand opportunity and a place in need of a hand up. This rich cultural melting pot of French, African and American cultures is redefining itself with experimental civil reengineering and the opportunity of a blank slate. With open arms the Louisiana Office of Entertainment Industry Development has welcomed the creative minds of the day, pushing tax credits and other stimuli to attract film and television productions to its gulf shores. 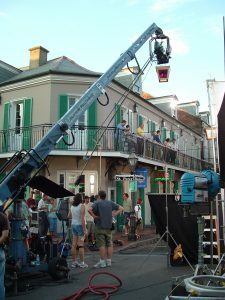 The film and television industry has answered the call by returning to Louisiana to film world class productions in state-of-the-art facilities while creating a positive environmental, social and economic impact on a state in the throes of recovery. Computers, cell phones and tablets are readily available and already used for the bulk of daily communication. So, why are many film and television productions still using paper copies to communicate on set? Does paper, as a physical entity, still hold its traditional allure? Or, is the production industry ready to make the jump into fully digital production? To answer these questions we sat down with Entertainment Partners’, George Hrico, Scenechronize® Product Implementation Specialist, and Darren Ehlers, SVP of Products, to discuss the status of digital production and learn a bit more about how production technology can be used to support on-set environmental, financial, security and efficiency initiatives. Despite predictions that the digital revolution would make paper obsolete, many film and television production sets are still dependent on paper for on-set communication, scripts, call sheets, one liners and on-boarding documents. While omnipresent and seemingly infinite in supply, the impact of paper consumption and disposal is large and growing. When burning waste is a better option than recycling, you’re not going green—you’re going Greenland.